This is one of my top favorites and have got so many hooked on it now. It is absolutely divine! 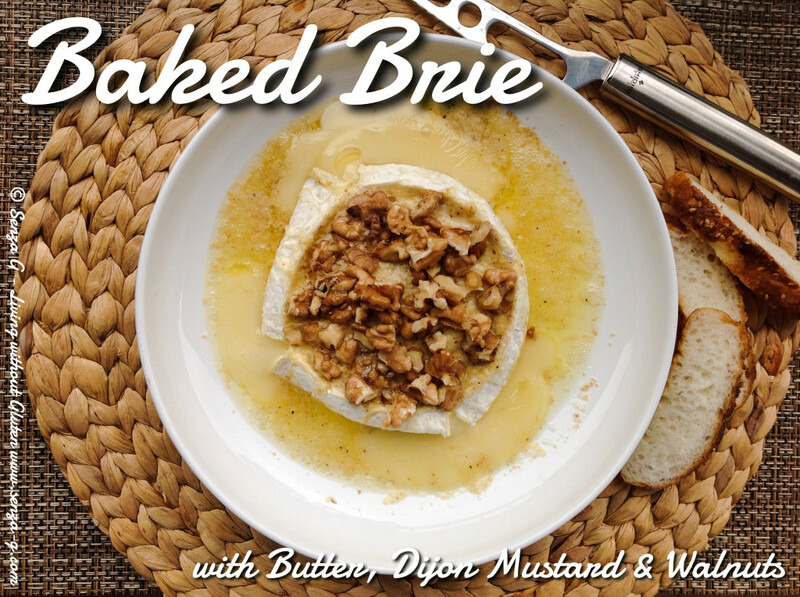 Molten french cheese with butter, a touch of Dijon and crunchy walnuts! It does not need that much preparation and can be on the table in less than 15 minutes. You can use either Brie or Camembert for this recipe. I myself prefer Brie as it tastes a bit milder than the Camembert. Lately I have been adding another ingredient to this recipe … honey! Just a drizzle of honey on top when you take it out of the oven. This comes with a warning – not suitable for the calorie conscious! Preheat the oven at 180C. In a small bowl, cream the butter with the Dijon mustard and spread this evenly over the surface of the cheese. Place the cheese in an oven proof round dish. Bake for about 6 to 7 minutes or until the butter starts to bubble slightly. Sprinkle the surface with the chopped walnuts and then grill it for another 2-3 minutes until the nuts are golden. If desired, drizzle some honey over the top. Serve immediately with warm crusty or toasted bread slices.